TheTownCrier: Best of the Web! 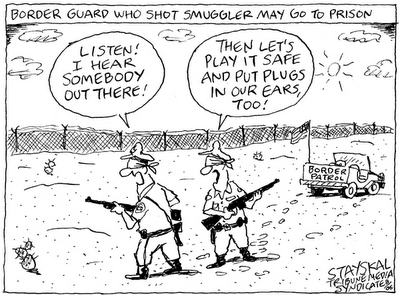 News you missed-BORDER AGENTS! HOLY CRAP!! Peter Boyle, R.I.P. By now, everyone in North America, and especially certain Mexicans are familiar with the case of two former Border Patrol agents convicted of causing serious bodily injury, assault with a deadly weapon, discharge of a firearm and violating the civil rights of a drug smuggler and illegal alien at the U.S. - Mexican border. Absent of a successful appeal or a presidential pardon, former agents Jose Alonso Compean and Ignacio Ramos will begin serving their 10-year-plus sentences in federal court this Wednesday. Mr. Parsons stated that the aggressive prosecution, replete irregularities pertaining to the arrest and trial of the two agents, including but not limited to venue issues, restriction of exculpatory testimony and evidence, government corruption and jury misconduct "has made a lot of agents on the front lines 'gun shy' and afraid to do their jobs." He added that "if this can happen to agents Compean and Ramos, it can happen to any one of us." It is also sending a strong message to illegal aliens, drug smugglers, and potential terrorists illegally crossing the border into the U.S. everyday. Those involved in illegal border activities see this as a victory for them, endangers the safety and welfare of the officers on the front lines and compromises the safety and security of every man, woman and child in the U.S.
"Morale? What morale? It is as bad as I have ever seen it," stated Mr. Parsons describing the mood of agents fighting the battle at the border. PLEASE!~ Call the whitehouse about the border agents Compean and Ramos. Since prisons filled with aliens this is a death sentence just for doing their jobs! Please send your comments to comments@whitehouse.gov. They are just now figuring this out??? However, the study showed although rural residents may be more directly involved in responding to crisis, their location makes them more vulnerable. Assistant Professor Courtney Flint and student Joanne Rinaldi interviewed 20 emergency coordinators across Illinois to determine what they are doing, what disasters they're prepared for and what they do between disasters. "What we've learned so far is that in rural communities there is a tradition of being more self-reliant," said Flint. "They're off the grid, so that makes them check on each other more, but they are also uniquely situated, closer in some ways to the physical environment and more isolated, making them uniquely vulnerable." While people in urban communities ask questions about liability, Flint says rural dwellers say, "We can't wait around for funding. If we need bandages, we'll just start ripping up old bed sheets." "Farm families have to keep going," said Flint. "They are more prepared for disaster. They have generators, kerosene heaters, snow plows and other equipment."